This is undoubtedly the best crêpe recipe ever created! I learned it from my bestie here in Paris, and who better right? 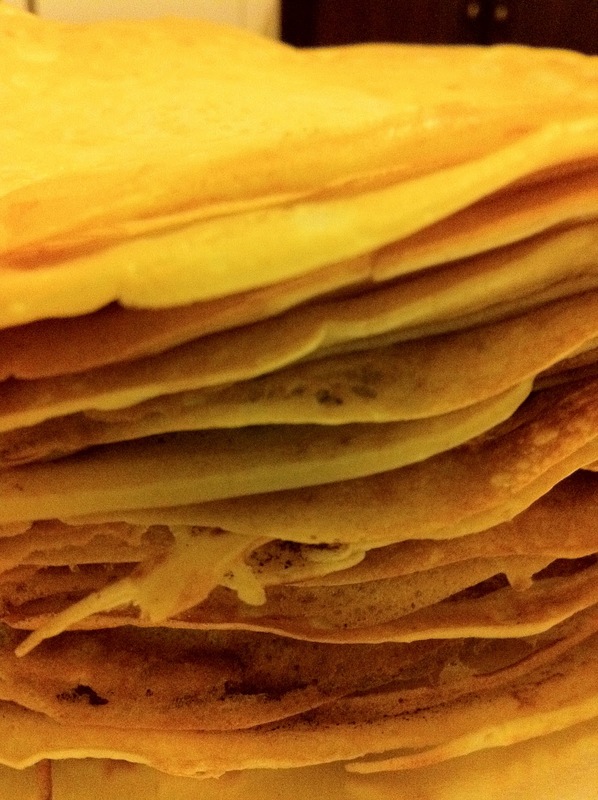 Crêpes are versatile, they’re a great dinner party food, but I also know friends from Brittany who literally make this recipe once a week so that they always have their regional specialty on hand all week long. 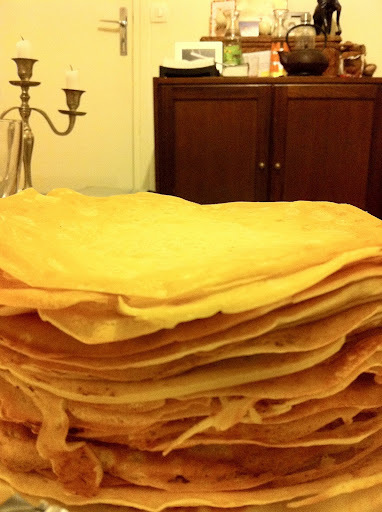 Crêpes come from the region of Brittany in France, where not a day goes by when you don’t think about crêpes, but there is one day of the year that everyone in France prepares crêpes with friends – a holiday called Chandeleur. The word Chandeleur comes from a pagan latin festival of festa candelarum when they would light a candle for purification. When the Catholic church came on the scene, they suggested that if you want to celebrate light, Believers also have a celebration where we remember the Jewish prophet Simeon who was promised to meet Messiah before he died, and when he met Jesus as a young boy, he prophesied, “This is the messiah I was promised to see, He will be the light of the world.” Crêpes are the form of the sun, a symbolic representation of the light come into the world. Of course, you don’t have to wait till the next February 2nd to light a candle representing the light that chases away the shadows in our hearts, any day of the year will do, but it’s kinda fun to have a special day when we are encouraged to do that – while eating crêpes! To celebrate Chandeleur with friends this year, I invited a dozen friends over to the house to play board games and eat crêpes together. This recipe has never-ever failed me. 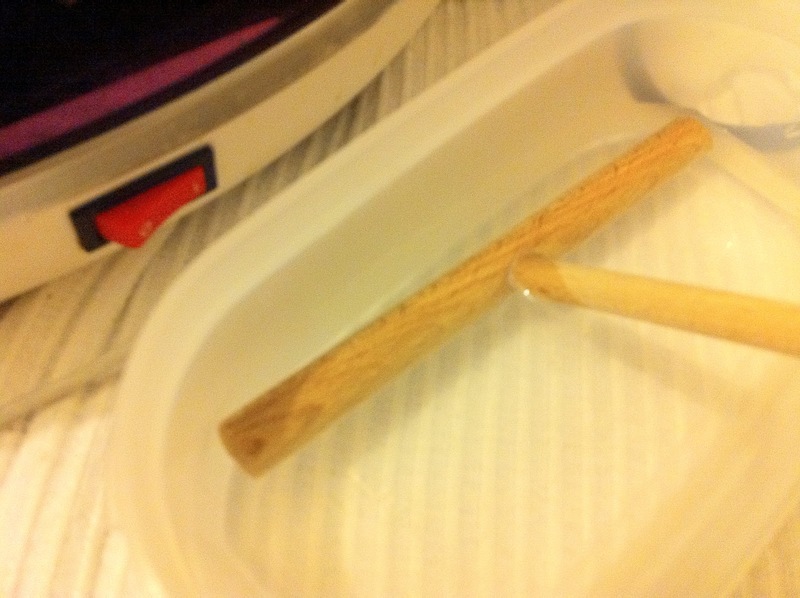 The crepes are paper thin and smooth. They’re lightly sweetened, but not as sweet as American pancakes. This recipe makes 25 crêpes in my crêpe pan that is about 8.5 inches in diameter. This recipe is easier if the milk and eggs are not cold, but already at room temperature when you begin. Melt the butter on the stove. While the butter is melting, mix all of the other ingredients in a large mixing bowl. Whisk until the batter is homogeneous. Continue whisking vigorously while you pour in the butter to incorporate it into the batter before it hardens. If you’re lucky the butter will whisk in and you won’t even notice it’s presence, but if your milk is cold sometimes you’ll see the butter bead up and you’ll have little butter lumps floating in your batter. The purpose for the butter is because you will not be buttering your pan, so tiny lumps will not make a difference they will melt instantly and still accomplish their job. I once had a big chunk of butter and I realized that this would probably be bothersome, so I fished out the chunk covered in batter and got another equal-sized piece of butter out of the fridge, melted it and did a better job of whisking the fresh bit of butter in. It worked splendidly. Today my batter was perfectly smooth, untraceable butter! 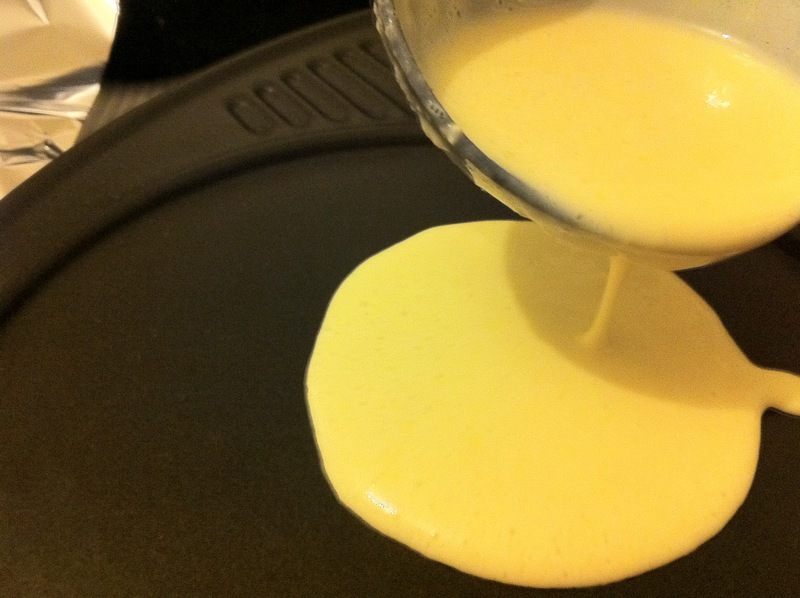 My favorite way to make crepes is on an electric griddle, but if you don’t have one, you can heat a shallow, flat non-stick pan to medium temperature. It is important that it is already hot when you begin. Lift the pan and bring it to your bowl of batter. Pour a small ladle (or half-ladle) of batter in the middle of the pan, tip and swirl the pan immediately so that the puddle spreads thin and smooth to cover the pan, and replace the pan on the stove. 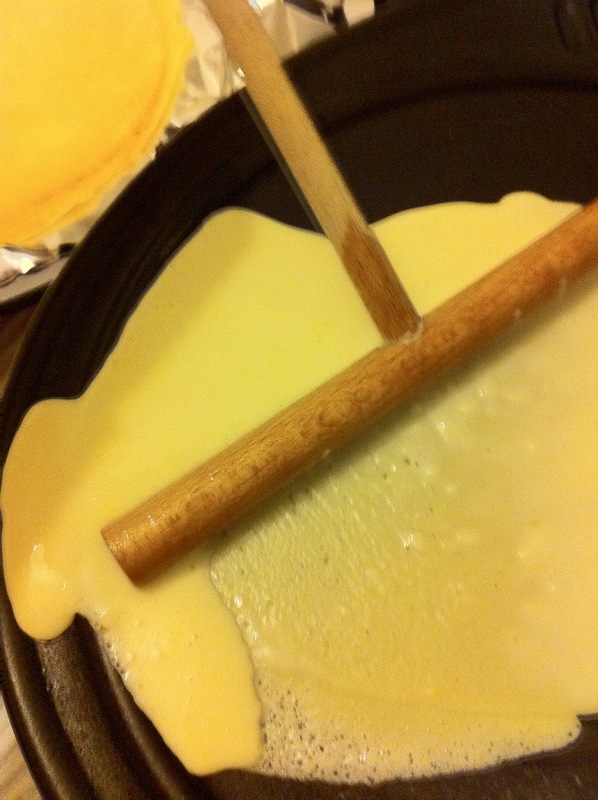 There is a crêpe spreader tool that you can buy that is like a wooden dowel rod that pushes the batter in a circular motion so that it gets extra thin. This is my favorite method, but you need quick reflexes to spread the batter faster than it can cook. If you are using something to spread the batter extra thin, let it set in a bowl of water between each use to avoid the build up of batter caked onto it. They also make a crepe spatula (a paper thin metal spatula or a very thin wooden tool with a beveled edge to help you get under the crêpe without tearing it) but you can use any wooden or plastic spatula to flip the crêpe when one side starts getting toasty-colored. Cook the other side a bit before transferring it to your plate and eating it immediately while it’s still nice a crispy. You can also wrap your left-over crêpes in aluminum foil and keep them in the fridge for a week. Or layer parchment paper between each leaf and freeze them in a ziplock bag for a quick addition to breakfast. – Smoked salmon, sour cream, chives and fresh squeezed lemon juice. – Your own creation, anything goes!